The Van Kleef family, who originally came from Amsterdam, lived from 1932 onwards in Soembastraat, but moved to 81 (now 83) Ceintuurbaan in 1940. The family consisted of Jacob, born in Leeuwarden on 12 April 1887, his wife Dina Frank, born in Coevorden on 24 April 1883, and their son Levy, born in Assen on 18 December 1921. Mr. van Kleef was a salesman with Blue Band (the Margarine Company), where he started on 15 April 1919 and where he earned fl 3.516,- a year in 1941. 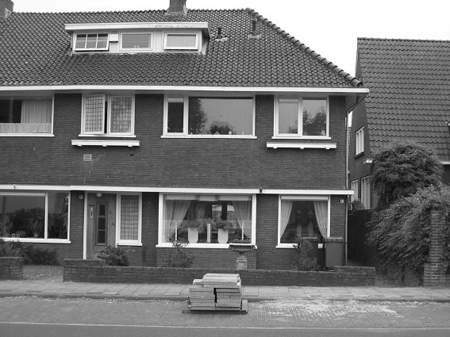 The family lived a pretty isolated life; they only kept in touch with brother and sister Cohen from Emmastraat. The fact that their son Levy was mentally handicapped may have been part of the reason. They could not leave him at home alone, nor could they take him wherever they wanted. Levy’s nickname was ‘Gekke Louitje’ (Loony Louis).He walked with a bent back and always wore a hat when he went outside. His mother kept calling: ‘Walk upright’, which he did as far as Pelikaanstraat, where his mother could not see him any more. Pretty soon the Jews had to give up their radio sets. The Van Kleefs were among the forty families who had to do this. Levy van Kleef, unemployed, born 18-12-1921, living in Meppel, at Ceintuurbaan 81, is confined to his sick bed. He is an idiot. A change of address card is requested for his admission to the mental home ‘The Jewish Invalid’ in Amsterdam. Naftali Keizer, secretary and treasurer of the Israelite Poor Relief, managed to get Levy there. Mr. Keizer devoted himself to working for this institution. Every year the institution organized a lottery in all the provinces, usually starting with a warming up by the director of the institution Mr. I. Gans, a well known person in those days. In the Meppeler Courant of 31 march 1930 Mr. Gans mentioned the important place the lottery had in the hearts of the inhabitants of Meppel, in view of the enormous success of it in Meppel. The enthusiastic support of this newspaper has certainly contributed to this. Mr. Keizer’s connections must have helped to get Levy into the institution. About 1910 the Central Magazine for Israelites incited people to found a place for poor, invalid fellow believers. In 1911 the initiative was taken under the supervision of the rabbi dr. Meyer de Hond. The following year a Jewish home was opened at 70 Nieuwe Keizersgracht. It was extended with two annexes and moved to 98 Nieuwe Achtergracht in 1925. The big fund-raising drives (also by radio) got a national reputation and resulted in extension and a new building in Weesperplein in 1937.On 1 March 1943, 400 patients and many members of the staff were carried off and killed. After the war it became a hospital and later the office of GG&GD (the Municipal Health Authorities). In itself this was not such a bad option to take Levy there, for it was considered to be a safe place. Many people offered themselves as unpaid staff members and some even paid to be allowed to join the staff. It was really packed to the attics with 416 patients, 197 resident members of the staff and 158 external ones. On September 1942 the Jewish Council wrote a letter saying that it was necessary to maintain the institution. The Germans probably ignored this request. They had not been very interested in the building and its inhabitants at first, because of its position near the Jewish quarter and its unattractive appearance. They had also been too busy collecting Jews from other places, until 1 March 1943, when the Jewish Invalid came into the picture. Levy van Kleef must have arrived there by the end of August. He was admitted to a group of about 400 elderly people, partly paralyzed, sick or blind, and mentally handicapped people. There was a shortage of nearly everything and the building was packed. One can easily guess how he must have felt there. From the protection of his parental home he entered a completely different world, which he did not understand at all. 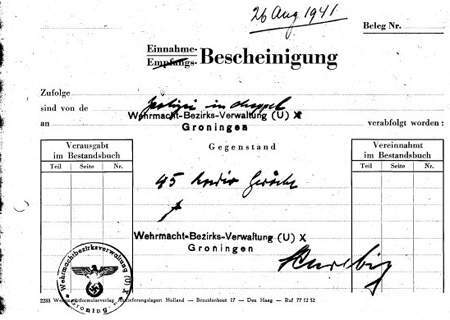 Nothing is known about his life in the institution, but we do know that he was transported to Westerbork even before 1 March 1943. Was he too hard to handle, didn’t he fit in the organization or was there another reason? He probably left Westerbork on a transport of 516 people to Auschwitz, where he was murdered on 25 January, without ever seeing his parents back again. Jacob and Dina had died by that time. At the end of July, Jacob had left for Camp Orvelte with a group of other Jews and was taken to Westerbork from there. Dina had been fetched from her house, together with Bep Cohen, who was staying with her. In the early morning of 3 October they were taken to Westerbork, where Dina was united with her husband for a short time. On 5 October they both departed to Auschwitz, where they lost their lives on 8 October. Their thoughts must have been with their helpless son, who was somewhere in Amsterdam, left to his fate. The home of the Van Kleef family on Ceintuurbaan.